Leading Exporter of medium duty manhole covers, heavy duty manhole covers, square manhole covers, rectangular manhole covers, round manhole covers and double triangular manhole covers from Kolkata. These manhole covers are mainly used in areas meant for medium traffic Areas such as Car parks , Pedestrian Areas and Connecting roads , where vehicular Movement is not very low nor very high.These Plain Sealed or single sealed manhole covers & Frames or Double Sealed Manhole Covers & Frames are not very heavy In weight nor very light too and can withstand 125 KN / 12.5 Tons of load to 250 KN / 25 Tons of Load.These manhole covers are offered in Cast Iron and Ductile iron. 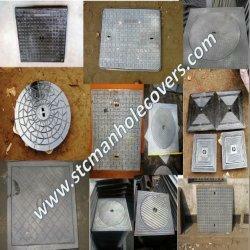 Medium duty manhole covers & Frames comes in different Shapes and Sizes . 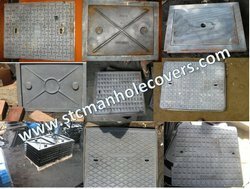 Square Manhole Covers , Rectangular Manhole Cover and Round Manhole Cover are common shaped manhole covers in this class.Sizes ranges from 300x300 mm Manhole Covers to 900x900 Manhole Covers. 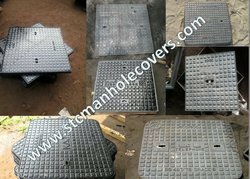 450x450mm Manhole Covers & Frames , 600x600mm Manhole Covers & Frames & 600 Dia mm Round Manhole Covers & Frames are the leading sizes in this class of Manhole Covers & Frames. These manhole covers are mainly used in areas meant for heavy traffic Areas such as Car Parks , Truck parks , Industrial Areas , Highways where vehicular Movement are high and heavy Vehicles are used.These Double Sealed Manhole Covers & Frames are heavy In weight and can withstand from 400 KN / 40 Tons of load to 900KN / 90 Tons of Load. These manhole covers are offered in Cast Iron and Ductile iron. 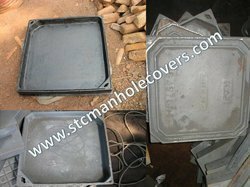 Heavy duty manhole covers & Frames comes in different Shapes and Sizes . 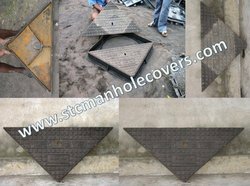 Square Manhole Covers & Frames , Rectangular Manhole Cover and Round Manhole Cover & Double Triangular Manhole Covers & Frames are common shaped manhole covers in this class.Sizes ranges from 300x300 mm Manhole Covers to 900x900 Manhole Covers.600x600mm Manhole Covers & Frames , 600x900 mm Manhole Covers & Frames & 600 Dia mm Round Manhole Covers & Frames , 675x675 Double Triangular Manhole Covers & Frames and 600x600 Double Triangular Manhole Covers & Frames are the leading sizes in this class of Manhole Covers & Frames. Commonly sighted manhole cover & frames in our day to day life.This Square Manhole Covers & Frames consists of two portions , One Cover and One Frame which is used to cover the drains to prevent escape of Foul Gases and Prevent Accidental and Unauthorized Access to the Drains.Square Manhole Covers& Frames are fixed to provide the LID or manhole Covers over the drainage for an easy access to the Authorized person for the Inspection or Cleaning the Drainage.They are also Known as Inspection Chambers widely. Available from the Size 300x300 till 1000x1000. This Square Manhole Covers & Frames are available in All grades From Light Duty to Heavy Duty.These come with an option of Single Sealed or Double Sealed . This also provided GRP Provision in few sizes as required by the clients. They Boast an Open or Closed Keyholes , This Square Manhole covers & Frames and the Basic manhole cover and frames used in todays time. Rectangular Manhole Covers & Frames consists of two portions, One Cover and One Frame which is used to cover the drains to prevent escape of Foul Gases and Prevent Accidental and Unauthorized Access to the Drains. Available in the Size 600x450mm Manhole Covers & Frames , 600x750mm Manhole Covers & Frames , 600x900mm Manhole Covers & Frames and 1200x900mm Manhole Covers & Frames. This Rectangular Manhole Covers & Frames are available in All grades From Light Duty to Heavy Duty.These come with an option of Single Sealed or Double Sealed . This also provided GRP Provision in few sizes as required by the clients. They Boast an Open or Closed Keyholes . 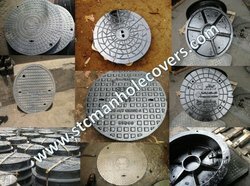 Round manhole Covers & Frames are one of the oldest design manhole cover . These Round manhole covers and frames can be located everywhere and are widely used .STC Offers Round Manhole Covers & Frames with Hinges and with Locking Devices for better access and better security of the manhole cover.Round manhole covers are widely and commonly used for some of its unique design characteristics , Such as it cannot fall inside the Pit even its inserted Diagonally , they are not required to rotate for aligning , can be easily moved by rolling the same instead of lifting and carrying the same .Round manhole covers & Frames can be easily locked in place with a quarter turn. They are then hard to open without a special tool. Also then they do not have to be made so heavy, because traffic passing over them cannot lift them up by suction.Round Manhole Covers & Frames are available in all class and grades from Light Duty to Heavy Duty . 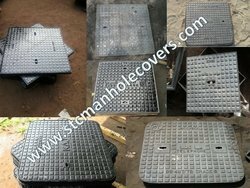 450 Dia manhole Covers & Frame , 600 Dia Manhole Covers & Frames , 750 Dia Manhole Cover & frames are the common sizes in Round manhole Covers & Frames. Double Manhole Covers & Frames consists of Three portions, two Cover and One Frame which is used to cover the drains to prevent escape of Foul Gases and Prevent Accidental and Unauthorized Access to the Drains.These come with an option of Single Sealed or Double Sealed and with GRP Sealing Plate Options ,Double Triangular Manhole Covers & Frames are used for their robust construction and Wide Opening space which provides an easy access to for the maintenance for the sewages.Double triangular Manhole Covers & Frames comes with Hinges with opening Upto 180° degrees .Available in the Size 600x600 mm Manhole Covers & Frames , 675x675mm Manhole Covers & Frames , This Double Triangular Manhole Covers & Frames are available in All grades From Light Duty to Heavy Duty. Access Manhole Covers & Frames consists of Seven portions, 6 Covers and One Frame which is used to cover the drains to prevent escape of Foul Gases and Prevent Accidental and Unauthorized Access to the Drains.These come with an option of Double Sealed and with GRP Sealing Plate Options ,Access Manhole Covers & Frames are used for their robust construction and Wide Opening space which provides an easy access to for the maintenance for the sewages.Access Manhole Covers & Frames comes with Hinges with opening Upto 360° degrees . Available in the Size 1200x600 mm Manhole Covers & Frames , 1800x900mm Manhole Covers & Frames , This Multiple Covered Manhole Covers & Frames are available in All grades From Light Duty to Heavy Duty. Double Seal manhole covers are the medium duty and the heavy manhole covers with are commonly used for the areas where the Medium & Heavy Traffic movements. Double Seal provides more stability to the manhole covers by provide a duplicate vertical relationship with the covers edge and the frame. This helps manhole cover to take more pressure without cracking or bending it . Looking for Manhole Covers & Frames ?